Adele Renault is a Belgium painter known for her realistic portraits from small scale canvases to wall sized murals. She is also known for depicting a real life pigeon called Camp. Adele was born in Belgium in 1988. She lived in a musical family on a farm in Ardennes. When she was only 14 years old, she traveled abroad all alone – living in Venezuela and Brighton. Renault got her degree in visual arts – exploring it from the classical paintings to the street art. Adele graduated in Graphic Design at the Academie Royale des Beaux Arts in Brussels. In 2009, this artist started to travel all around the world with just one goal – to spread her artistic vision and share it with as much people as she can. 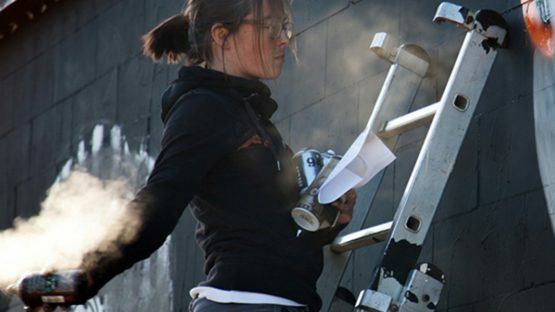 She collaborated with a fellow artist Niels Shoe Meulman on many large scale murals where she would depict a site-specific birds and animals, complementing so his iconic word-images. This duo also founded the Unruly Gallery in Amsterdam. Adele founds her inspiration in a beauty of everyday objects. And subjects as well – in 2013 she created a series of elderly people’s portraits titled Elderlies. But, one of her most known projects is the one that follows the destiny of a pigeon called Camp. The story of Chicago artist George Keaton and photographer Mariah Naella deeply moved Adele. This couple found on their kitchen table a tiny egg, left by the workers that were replacing old window frames. The workers found it after they, by accident of course, destroyed a pigeon nest while fixing windows. This artistic couple decided to keep it safe after they saw some movements in this discarded egg. Soon, the Camp was born and by so the new Adele’s series came to life. She followed Camp’s life, documenting his every day’s and most heartwarming moments. No wonder Adele was intrigued by this event – she is well known for her fascination by the inconspicuous beauty of small life event and things. By observing closely, she is finding those moment worthy of a second look, full of stories and meaning. She is represented by Art is Just a Four Letter Word Gallery. Adele Renault lives in Amsterdam, The Netherlands.